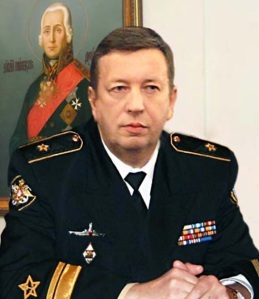 Russian Navy commanding staff headed by Commander-in-Chief Admiral Vladimir Vysotsky recently met in St. Petersburg. Reporter of Central Navy Portal talked about current condition and future of Black Sea Fleet with its commander, Rear Admiral Alexander Nikolayevich Fedotenkov. – Alexander Nikolayevich, as is known, Russia has no submarines in the Black Sea now. So when Black Sea Fleet will receive first Project 636 subs? – They will be constructed by Admiralteyskie Verfi shipyard. It is planned to build 6 such subs. First three of them will join Black Sea Fleet in 2014, another one will be commissioned in 2015, the rest two – in 2016. By that time, we plan to create conditions for a full-fledged submarine brigade. Also, Project 877V diesel submarine Alrosa will return to the fleet. – What will be a homebase for those new subs? Sevastopol or Novorossiysk? – This matter is under discussion. We plan them to be stationed both in Novorossiysk Naval Base at the new quayside, and in Sevastopol. As of the latter base, that will happen after arrangement of some issues with Ukrainian partners. In relationship with Ukraine, we primarily rely on the framework agreement of 1997 providing that we must keep number of ships and strength of troops as it was in 1997. Hopefully, the preparatory work we have done would help to sign a new agreement with Ukraine determining numerical strength and organizational matters of replacement of old ships with new ones. I think, this agreement will be signed by the time new Project 636 subs come to the fleet. – Attending the annual naval command forum, you visited Admiralteyskie Verfi shipyard. Apart from Project 636 submarines built for Black Sea Fleet, there are Project 677 Lada subs at different levels of completion. What is final decision on them? Will they be completed and modernized? – When the lead sub St. Petersburg is repaired, she will have to pass trials, including those at Northern Fleet. Afterwards, it will be decided on completion of the rest subs. I believe that if trials of St. Petersburg are successful in the north, at deep waters, and all advanced technical solutions are proven, it will be finally decided to complete two other hulls. – As is known, staying in Novorossiysk Grachonok-class anti-terror boat is going to join Black Sea Fleet soon. That will be the first vessel commissioned into Russian Navy in 2012. Has the date of the ceremony already been set? – Nope, the date has not been determined so far. I am inclined to think that we will prepare and hold the flag-hoisting ceremony by May. Although having no name yet, the ship will definitely enter harbor defense force of Novorossiysk Naval Base. – There are some overseas naval assets within the Black Sea Fleet responsibility area, in particular, technical support base in Tartus, Syria. What are its prospects? Is it supposed to develop? – Well, political decision on the Tartus base will be made at the summit level but not by the fleet command. As for me, this base is essential both for Black Sea Fleet and Russian Navy in general. – Thank you very much for interesting answers.